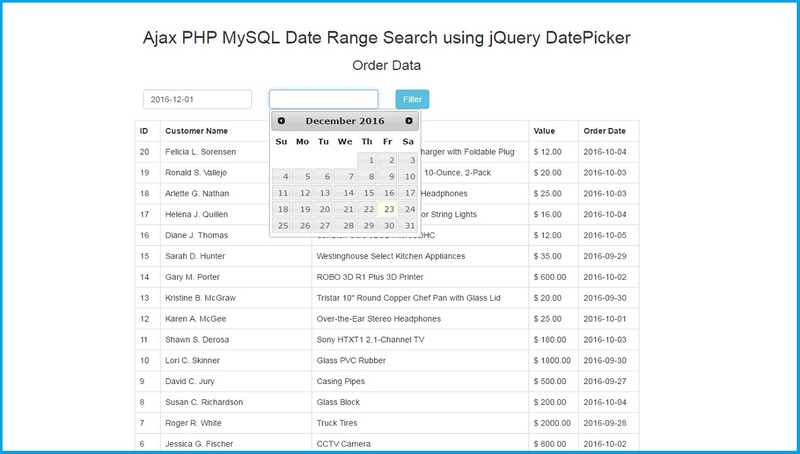 Hello friends in this post we are going to discuss how to make php script for search mysql data between two date without page refresh by using Jquey date picker with php and Ajax. Here we will search data from mysql database based on date between two given date range and when we will click on filter button then it will send request to ajax method and by ajax method it will send request to php script and then after php script search data from database based on two given dates and send back to ajax method and we can show filter data on web page without page refresh. Here we have use jquery date picker for choose the dates for the search options and based on this two dates we will use this two dates into database query with between clause and we will filter data based on two date range. Here we have make a simple php script which has been called by ajax function. Suppose we have not select both or any one of the date then it will not filter order data and return back alert message. But suppose we have select both date then it filter order data between from date and two date. When we have click on filter button then it has been execute jquery code in which we have make ajax request and it send request to php script and php script work on server side and it search data from order table based on which date we have select through jquery date picker. Then after php script send back data to ajax method in html table format and though jquery we have display which data we have received from server side in html format we have display on we page without page refresh event. Very useful, keep going Sir. How do you clear filter? ?